The Cloud Of Unknowing is a manual on contemplative spirituality by an anonymous author, written about 1375. Here it is introduced by the initial 'I' halfway down the page: 'In the name of the holy trinity, here beginneth a book of contemplation, the which is cleped the Cloude of Unknowing . . .'. 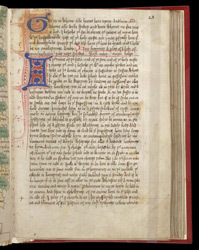 A later owner has glossed the Middle English word 'cleped' with its modern equivalent 'called', in the left margin.